The picture “Storm on the sea at night”, was written in 1849, famous painter Ivan Konstantinovich Aivazovsky. The artist belongs to the seascapes, since he devoted all his creativity to creating paintings depicting the sea in all its manifestations. The general mood of the picture, very truthfully conveys the state of the night raging sea, which plays with a sailboat, like a small piece of wood. As it seems to me, the artist achieved this effect, thanks to an exact choice of color and masterful execution. In the background of the picture, I see a terrible night sky. Through the flying clouds and scraps of clouds, the full moon looked out. Having managed, only for a few moments, to break through a thick veil, she illuminates the doomed ship. I think that this light, albeit cold, still gives hope to the sailors for salvation. The whole front of the picture is occupied by the raging sea. I see powerful waves that go one after another. The artist, very realistically portrayed the raging elements. Looking at the picture, I have a strong feeling that all the efforts of the ship’s crew are in vain. Great rolls, bubbling foam on the crest of the waves, look awesome. In those places where the moon illuminates the waves, I realize the frightening depth of the sea. I think that this mood is caused by the fact that the well-known seascape artist used the play of light and shadow very well when writing the picture. A little to the left of the center of the picture, I see a ship, which from the last forces resists the ferocious onslaught of waves. Considering the picture of a brilliant artist, I hear the screams of doomed sailors and the cracking of wooden masts. These sensations arise from the well-written details of the ship. Scraps of sails and ropes, which IK Aivazovsky so vividly depicted, supplement the general state of the picture. 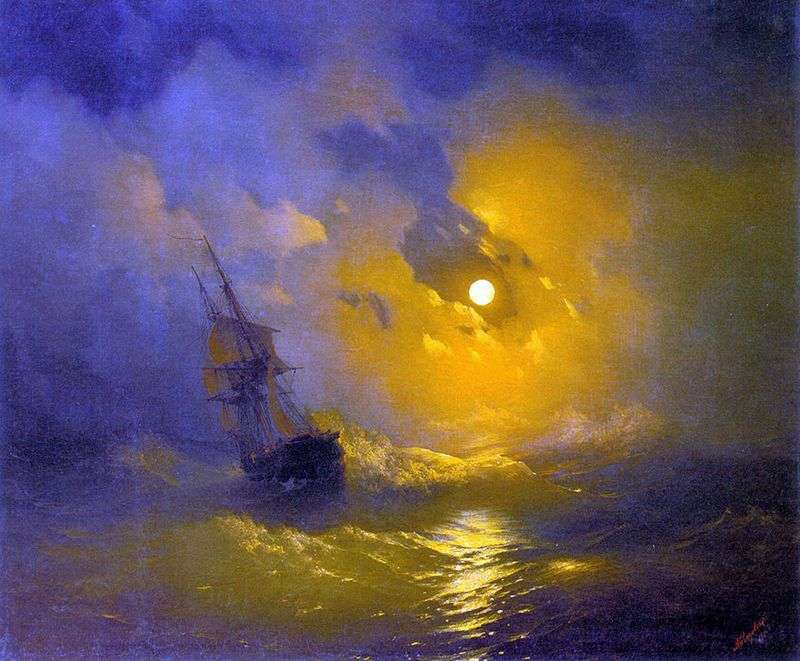 Description and meaning of the painting Storm on the sea at night by Ivan Aivazovsky.